Â Â Â Town situated in the Nellore district of Andhra Pradesh â€“ is famous for the cotton handloom sarees.Â Â It has got its own unique weaving excellence and one need not compare with any other technique â€“ whether it is hand woven or machine made.Â Even today â€“ one can specify and get a designer sarees for a price â€“ and that will be made for only one person one time.Â In fact in the earlier days â€“ these weavers used to weave very few sarees for the Kings, and the return they get from them was sufficient for whole of the year. The art of weaving and dyeing of cotton was known in India some 5000 years ago. We can say that it has taken its birth in India and then went to Egypt and China at a latter date. This has been established in different occasions in various modes and in several methods.Â There may be disputes from other people â€“ because today they are technologically superior and they can re write their history. Â Â Â Cotton fabrics are woven almost throughout the length and breadth of India. 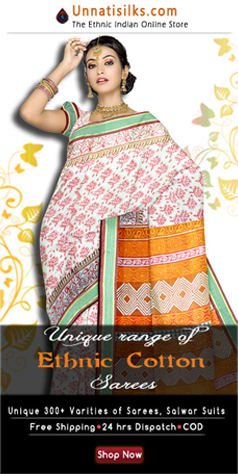 In West Bengal they are calledÂ JamdaniÂ and follow the traditional patterns. Twisted yarn is closely woven together and so the saris are more lasting. Initially the Jamdani saris were woven for the nobles of North India. Now this art is still practiced in Tanda and Varanasi. This inlay technique is fully indigenous. This Jamdani technique of patterning is found in the cotton centers of VenkatagiriÂ in Andhra,Â MorangfiÂ in Manipur and KodialkarrupparÂ in Tamilnadu. 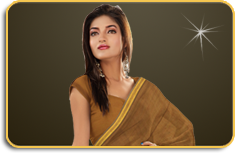 Venkatagiri sarees and salwar kameez are equally famous to its handloom weaves. The ethnicity and tradition of India are exerted in Venkatagiri attires. The six yards of elegance of a Venkatagiri saree is matchless and outstanding. These venkatagiri hand-crafted sarees are beguiling and are admired by women irrespective of age and regions. Following this path of sarees, salwar suits are also woven in Venkatgiri. The Venkatgiri salwar suits have a rich ethnic weaves along with fashionable designery works that makes a perfect match for the younger generation now.